Cupid’s arrow often points me in the direction of Valentine’s Day catastrophe. I will spare you the gory details of my many V-day disasters, but think messy break-ups, dislocated knees, stomach viruses, and an overwhelming heap of steaming disappointment, and you won’t be surprised to hear that Valentine’s Day has never been my favorite holiday. However, this year I have high hopes for Valentine’s Day, because I’ll make no frills about it besides using it as an excuse to indulge in far too much food, wine, and Netflix movies. The saying goes “the way to a man’s heart is through his stomach,” and I have no problem with that. As long as I get a plate piled up with goodness, too, I can boost your affections through food. You’ll bump yourself up a few notches in my book if you volunteer to do the dishes afterward. One thing that I find really romantic in the food department is breakfast in bed. 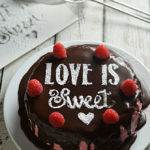 While I’ll never turn down bacon and eggs, Valentine’s Day is all about sweets, so breakfast on that day, in my opinion, should be a special treat to the sugar-lover. 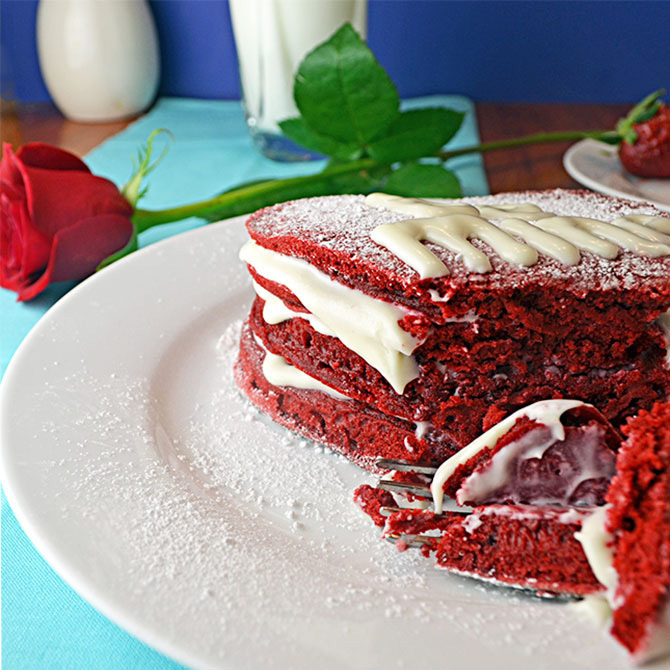 Ladies and gentlemen, without further adieu, meet Red Velvet Pancakes with Cream Cheese Frosting Syrup. This sweet treat really puts the cake in pancake, but who would complain about that? The pancakes are great on their own, but the cream cheese frosting syrup is really what puts it over the edge on the delicious scale. You can bet I’ll be making these for Valentine’s Day to start my morning off right! 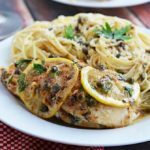 Best of all, I’ve tried making this recipe the quick way and the hard way, and I have to admit, they yield the same results. 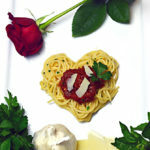 I’m going to give you the quick recipe, and hopefully that will save you some sleeping and/or cuddling time in the AM! 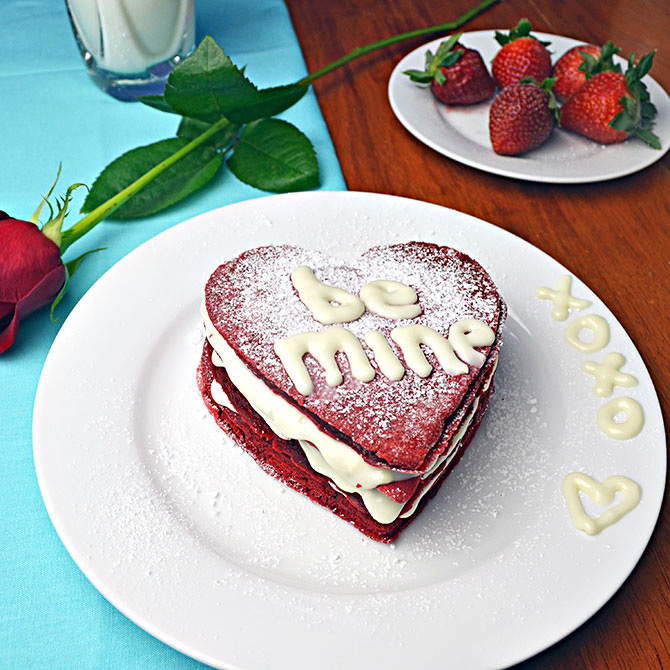 Make a sweet stack for your sweetheart with these Red Velvet Pancakes with Cream Cheese Frosting Syrup, and start the day off right! Using an electric hand mixer, combine the butter and cream cheese in a medium-sized bowl. Slowly add the milk and sugar, a bit at a time, until you reach your desired consistency and sweetness. Aim for thick syrup. Pour your syrup into a squeeze bottle dispenser to make it easy to decorate your pancakes with a special message. In a large bowl, whisk together all of the dry pancake ingredients. In another bowl, mix together the melted butter, buttermilk, vanilla extract, and eggs. Pour the wet mixture into the dry mixture and combine well. If you like thinner pancakes, add more milk until you reach your desired consistency. Grease a medium-sized pan and place over medium heat. Give the pan a few minutes to warm up. If you plan to make heart-shaped pancakes, grease the inside of your metal heart-shaped cookie cutter or egg ring. If using a cookie cutter or egg ring, place it in the pan. Pour in approximately 1/4 cup of the red velvet batter. Once the batter begins to form little bubbles and the side facing up doesn’t seem too liquidy, Flip the pancake. If using the cutter, you should be able to flip without using it to hold the shape any longer. If your pancake seems to turn out slightly messy, feel free to use the cutter/egg ring to fix the shape after cooking, and make sure to lower the heat and keep the pancake in the cutter longer next time. When the pancake has finished cooking, place it on a plate and squeeze on some of the cream cheese syrup on top. Then, place another layer on top, and repeat until you’ve finished. 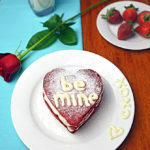 On the very top pancake, you can add powdered sugar and/or use the squeeze bottle of frosting syrup to write a note to your sweetheart, such as “be mine”, “love you” or “xoxo”. Serve with plenty of milk to wash it down! *If you want to make this breakfast even quicker to put together, simply pick up a can of cream cheese frosting and mix with milk until you get a thick, syrupy consistency. I prefer to make my own, but this option works, too! Gave this a shot for Valentine’s Day – pancakes kept turning black in the pan. 1) Depending on what kind of pans you use, medium heat might have been too high. A lower heat would have taken longer, but it may have allowed the pancakes to cook on the inside before the outside would burn, if that was the issue. 2) You may have used too much batter per pancake. 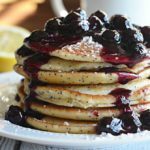 I didn’t attempt to make these pancakes extra-thick, so I’m not sure what the result would be if someone did try to do that, but I didn’t need to use very much batter per pancake. I can only assume that, if you did try to make yours thicker, the same issue as above would arise where the outside would cook too quickly compared to the inside. These pancakes rise a lot while cooking, so they look a bit thicker in the picture than they were when poured. Again, I’m very sorry to hear that these weren’t successful for you. 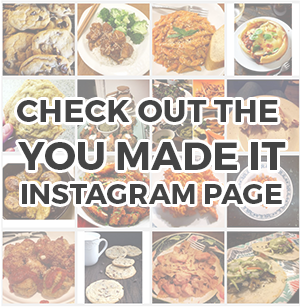 If you have any additional insight as to why you think that would be (I can’t tell you for sure, since I wasn’t there with you), I’d appreciate if you could share your thoughts so that people have better luck with this recipe in the future!